2010 will be known as the year where so many top international fine dining restaurants opened their doors in Singapore, thanks to the 2 IRs. 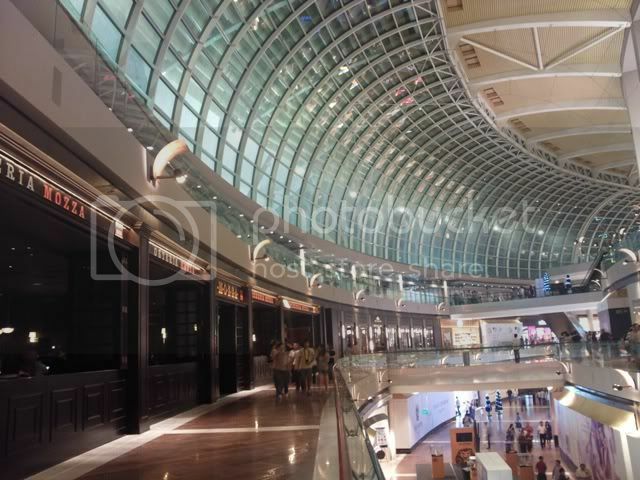 And the Shoppes at Marina Bay Sands is proving to be a great F&B destination for food lovers in Singapore with the opening of about 5 new and exclusive restaurants in both Singapore and this part of the world. 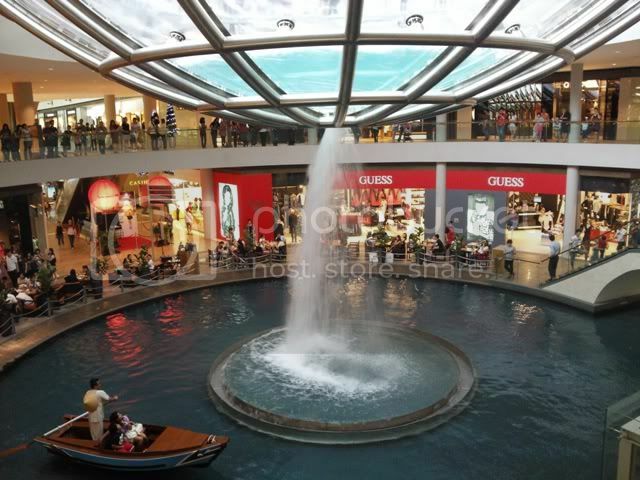 Although I have been to MBS for a number of times, this is my first time seeing the waterfall in the centre of The Shoppes MBS. Perhaps due to the heavy thunderstorm rain earlier in the day, shoppers were amazed by this visual feast of water crashing down from the half sphere. 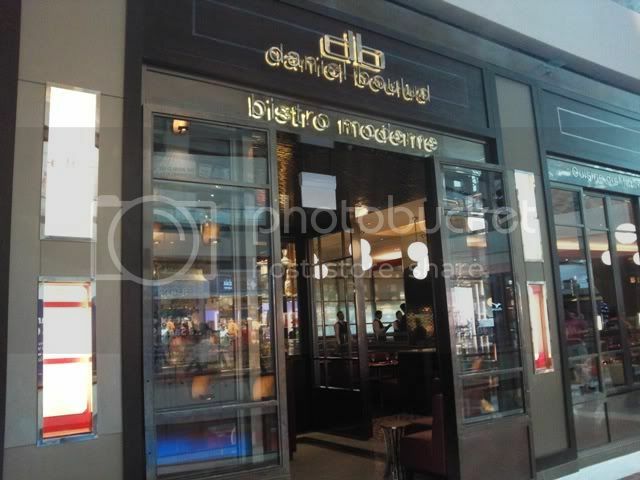 Famous celebrity chef Daniel Boulud was in town during the Christmas week (and also New Year week too), and we just had to pay a visit to his upmarket DB Bistro as we knew that he will be supervising the cooking in the kitchen. If you wonder why the setting looks a bit like American, yet also looks like a French restaurant, then you are correct. 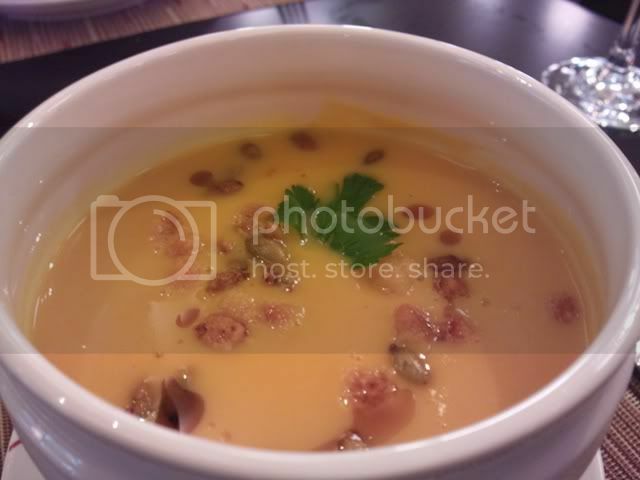 DB Bistro combines the best of French with American style of cooking. You won't find tex-mex food here. But the signatures here are their burgers. 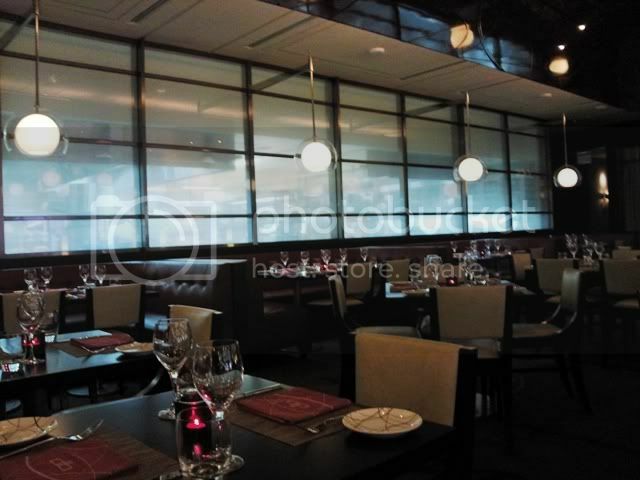 Diners can almost peep into the kitchen which is behind this long stretch of glass windows, and you may even spot Daniel Boulud inspecting the food through his black frame spectacles. Upon ordering our dinner, we were presented with quite a few choice of bread. First are 2 pastry rolls which have lot's of crispy cheese being baked into it. Then we were presented with the usual suspects of breads like baguette and sourdough bread with butter. We didn't see them putting a butter knife on our table though. 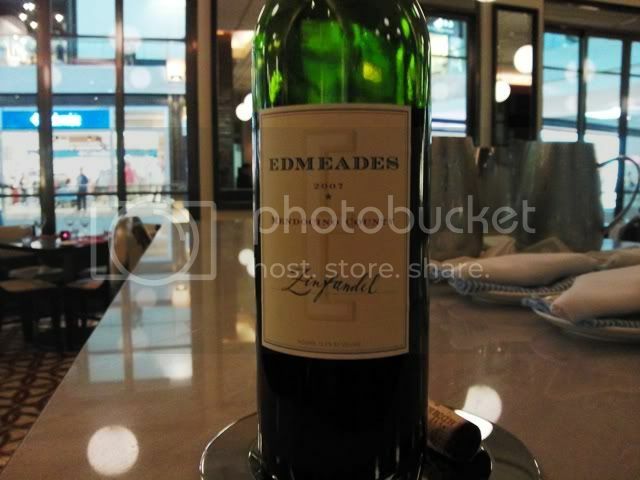 Edmeades Zinfandel 2007 (S$145) from the Mendocino County in California, USA. We had the Petit Plateau (S$60), which is basically a chilled seafood platter made up of what is fresh and available for the day. 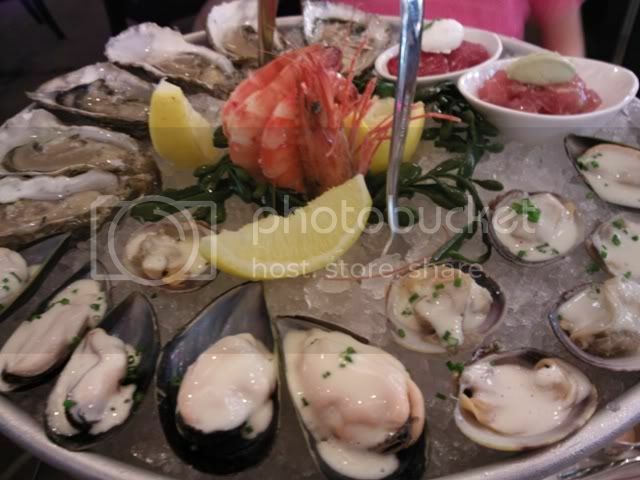 Highlights fro the platter were the fresh oysters, clams and mussels. I like the chopped salmon with basil mayo too. There were more dips for the seafood. I like the sweet red wine sauce and also the tangy mayo dips. 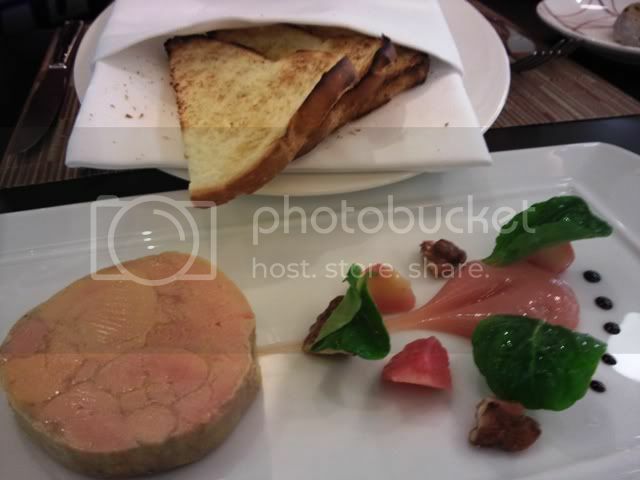 A signature here at DB Bistro Moderne, we had the Foie Gras Terrine (S$26) which came with their homemade brioche. 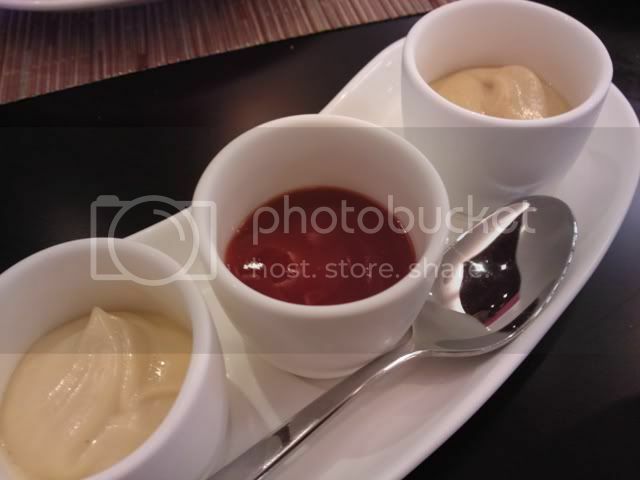 The brioche was free flow and the creamy foie gras was not too oily and went extremely well with the crisp brioche. 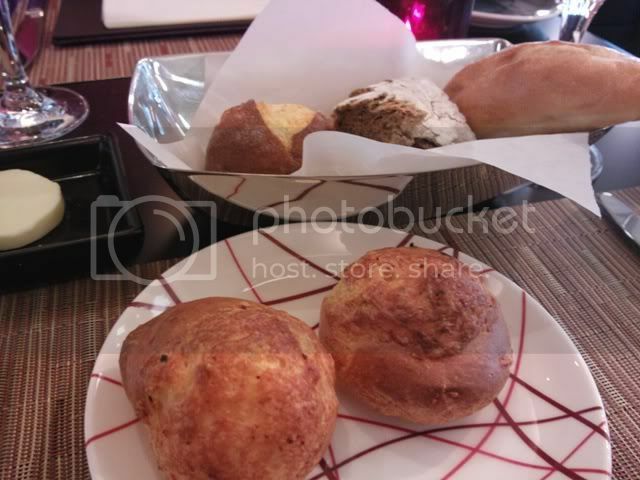 However, read some reviews that their brioche is not as good as those served at the DB Bistro New York City. 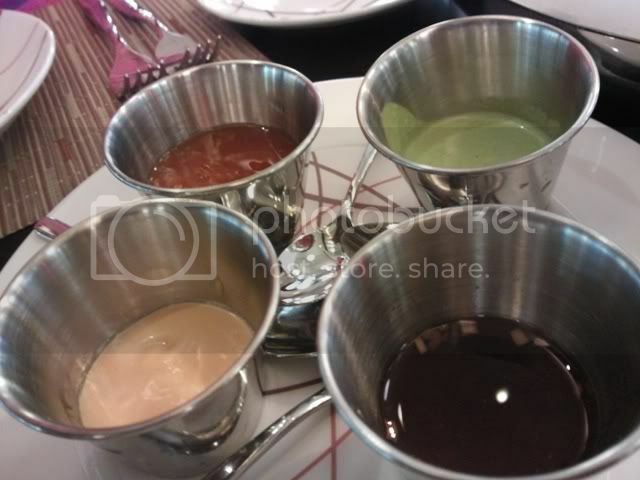 There is a quince (fruit which is a relative to apples and pears) sauce served at the side which helps to reduce the oiliness of the foie gras. A fun fact to note is that the quince is said to be the "apple" offered by Eve to Adam. 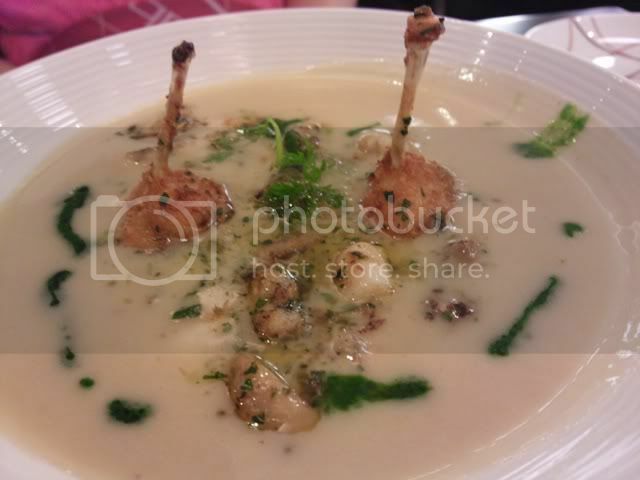 We had this off-the-menu soup - Frogs Legs Soup (S$18). They were very very generous with the frog legs meat. Lots and lots of it. When the staff asked us how was the soup, we commented that it was slightly too salty. Immediately, they insisted that we allow them to take back the soup and they change a brand new bowl of soup for us. Now, that is what we call excellent service. 5 stars for their service! The Butternut Squash soup (S$13) was equally delicious. It's rich and creamy, and I would advise diners to share their soups with each other. 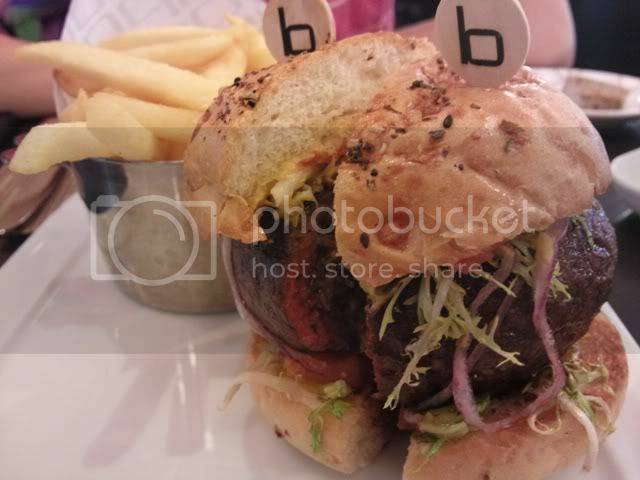 The Original DB Burger (S$35) is what makes DB Bistro Moderne famous all over the world. 2 warm and soft parmesan bread buns covers the juicy meats. It comes with really crisp and tasty french fries. In fact, the whole restaurant smelled of the wonderful fries, and it is addictive. 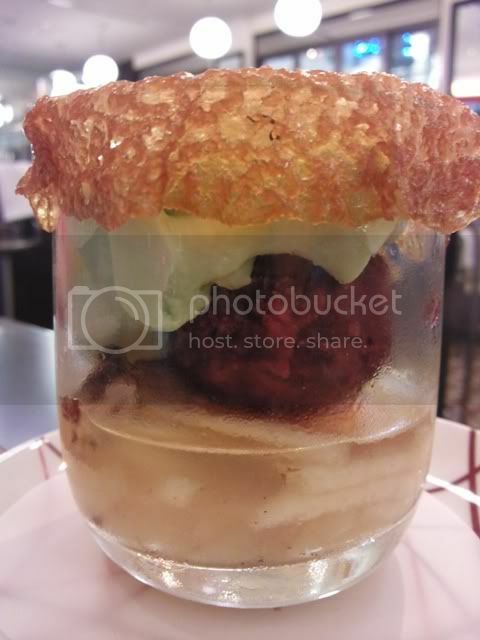 From this delicious picture, you can see that in the centre there are braised short ribs and a generous piece of foie gras, all wrapped around a juicy piece of sirloin. 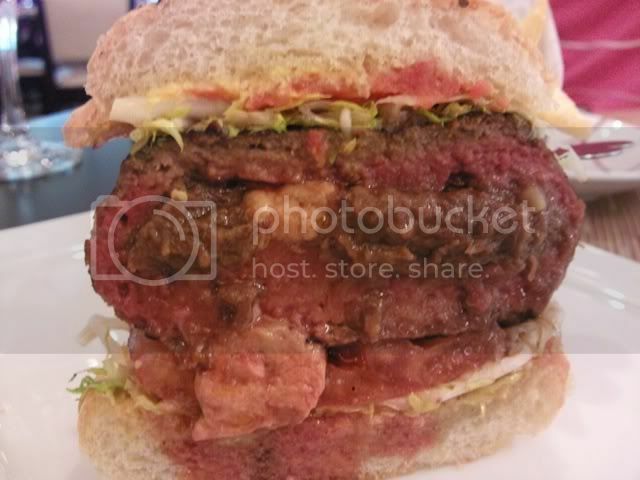 So is this really the best burger in Singapore? Well, I think it ranks as one of the best burgers in Singapore. Not really The Best, but definitely in the top 3 position. The burger comes with 3 dips for the fries - Dijon Mustard, Ketchup and Mayo. We still have some empty spaces for desserts, so we ordered not one, but 2. First is the Coupe Au Poire, a signature dessert made from poached pear. 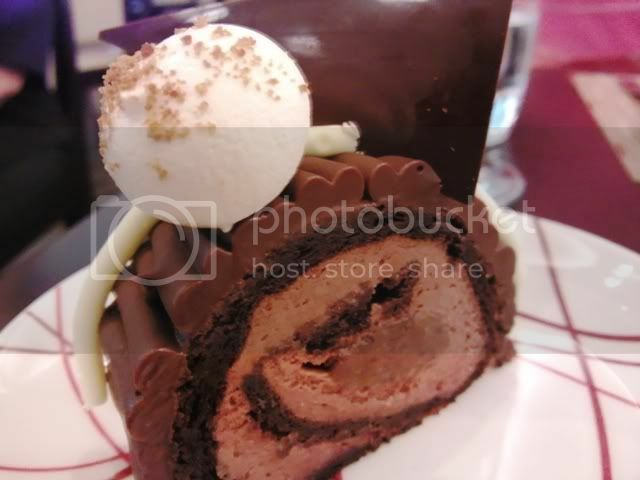 It was Christmas time and we had a slice of chocolate log cake on the house. The chocolate was creamy and had a tinge of bitterness, and I can taste good quality chocolates being used here. But but but, the star of all desserts here, are their freshly made Madeleines (S$8). These little morsels are baked upon order, so what you have is freshly baked Madeleines. It's a little crisp on the outside, and really soft in the inside. 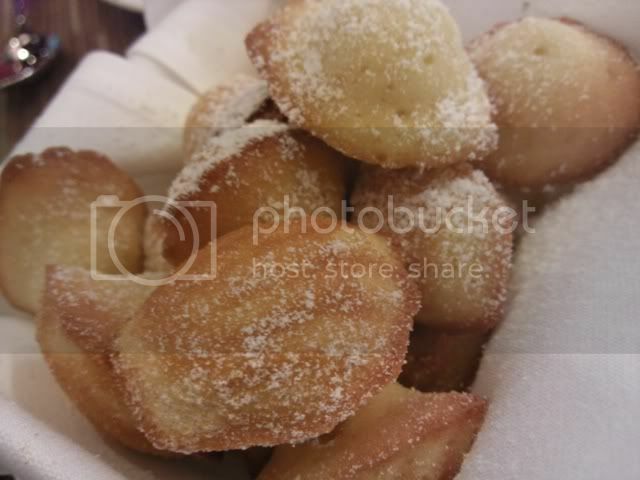 These are one of the best Madeleines I have eaten in Singapore. I wonder if we are allowed to order just their wonderful madeleines and a cup of coffee during tea breaks here? A must order. Both DB Bistro Moderne and Pizzeria Mozza are side by side along the theatre wing of the Marina Bay Sands. And these 2 wonderful restaurants will definitely rake in the crowds if they manage to maintain their standards. 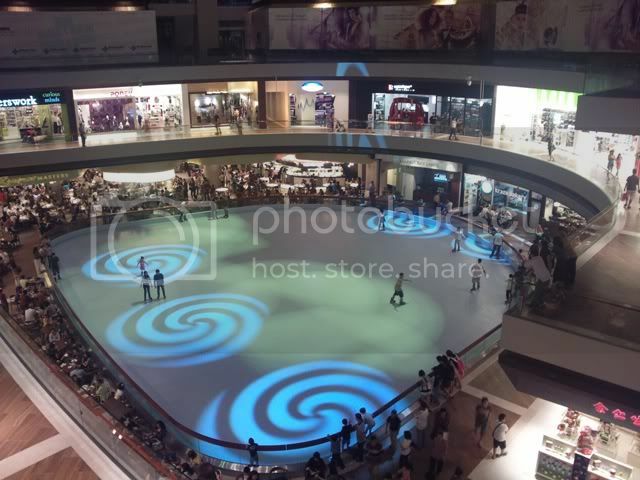 And near to the restaurants, the ice-skating ring has opened too. We will definitely be back for more of their creations very soon! the madeleines seem like a Daniel-thing. had them at Daniel nyc and they were so good!! "the madeleines seem like a Daniel-thing." Totally agree! I like your food review and photos! well done! Thanks Flor! Glad to know you like it. Hope our visitors enjoy reading our blog...not professional food critics, but a faithful recording of our dining experience. Cheers. 100th post, and time for a move.